Why 70% Isopropyl Alcohol (IPA) is used as Disinfectant in Pharmaceuticals? Know why 70% isopropyl alcohol ( IPA solution ) is used for disinfection of hands and equipment surface instead of 100% in pharmaceuticals. 70% isopropyl alcohol is most commonly used disinfectant in pharmaceutical industries. The important thing is that only 70% solution of isopropyl alcohol acts as a disinfectant killing all surface microorganisms. It is used to disinfect hands and equipment surface in pharmaceuticals. 70 % isopropyl alcohol solution kills microorganisms by dissolving plasma membrane of the cell wall. The plasma membrane of gram-negative bacteria consists of thin layer of peptidoglycan that easily destroyed by the alcohol. Therefore, 70 percent isopropyl alcohol is known as pharmaceutical alcohol. Water is also required to denature the proteins of the cell membrane and acts as a catalyst for the reaction. The contact time of the alcohol with the organism also plays an important role. A 70% solution of alcohol takes more time in evaporation from the surface, increasing the contact time. Therefore, 70% isopropyl alcohol fulfills both requirements. 100% isopropyl alcohol coagulates the protein instantly creating a protein layer that protects the remaining protein from further coagulation. Due to this organism is not killed but remains in a dormant stage. While 70% isopropyl alcohol solution penetrates in the cell wall at a slower rate and coagulates the all protein of the cell wall and microorganism dies. Thus 70% IPA solution in water is more effective than 100% absolute alcohol and have more disinfectant capacity. 1. 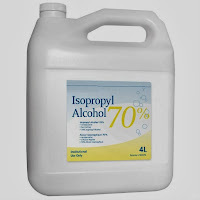 70% Isopropyl Alcohol should be prepared on daily basis. 2. Preparation should be done in the controlled area by production. 3. Freshly prepared 70 % isopropyl alcohol solution should be used. 4. For the preparation of the 70% IPA, purified water should be used. 5. The bulk container (used for distribution) of the 70% IPA should have the label with the details like name, prepared on, prepared by and checked by. While the small container label should have the details like name, prepared on and prepared by. 6. The prepared 70 % IPA should be analyzed chemically and microbiologically (by membrane filtration method). Very informative article. indian pharma and quality medicine.